Thinking about Tom and his amazing Jacobean times is actually easier when not in his exact footsteps. But I’m never far away, even back in London. Today I’m off to a conference on renaissance spies. 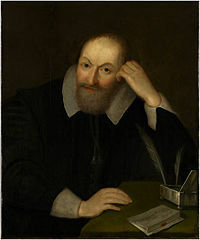 And especially Sir Henry Wotton, who was “bureau chief” as it were, in Venice – during the early part of the reign of James I. And who certainly met Tom in 1608. (There’s much more to Wotton, and maybe I will know after my conference). That’s him above. Meanwhile, back on the circle line…Paul Theroux tries to flog a new book in a free newspaper, and sounds as charmless as ever. Wasn’t he rather keen on V.S. Naipaul’s tracks once upon a time? A lot of travel writing is a stunt – “Ooh, I’ll bounce a ball around Iceland, I’ll throw a Frisbee around Namibia” – and doesn’t amount to much except someone in need of a subject. The other type is people thinking: “I’ll follow the tracks of Graham Greene, that’ll be exciting!” So I thought, some gap year punk’s going to do that about me, and I don’t want that – it’s my life, my trip, I’ll do my own return journey. This entry was posted in theroux, Travel Writing, wotton. Bookmark the permalink.